"Chipping away and sticking to the same approach we’ve used to advance that progress for the past 20 years – and I mean this literally for New Profit – will not turn possibility into reality and impact at scale. That’s why we’ve evolved our model over the last few years and launched our Focus Funds. We’re betting our future on collaborative, systems-focused problem solving." 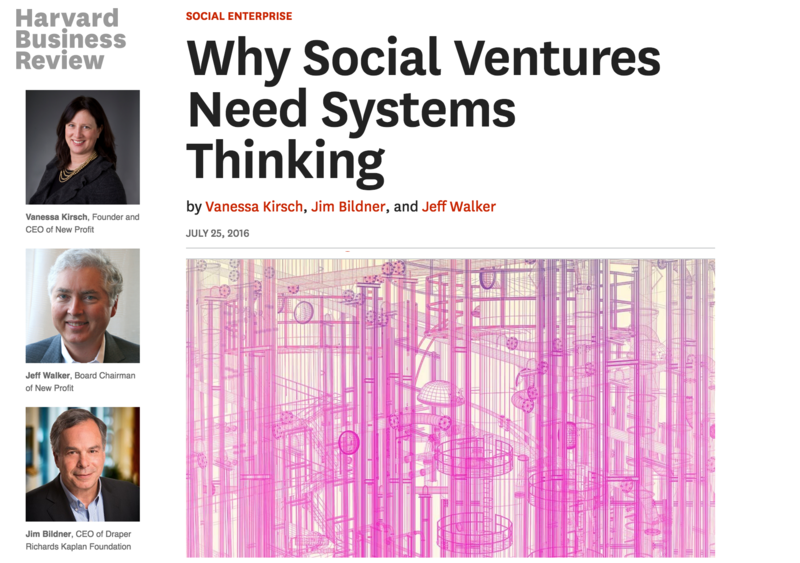 "Over almost two decades, the social enterprise space has been learning how direct impact and systems change work together. The work our entrepreneurs face today is more complex than ever and requires a set of tools and a framework designed to address the complexity inherent when innovations are integrated into existing systems like school districts, welfare agencies, health departments, and corporate structures." "Systems thinking. An individual or organization must first be able to put forward a new solution or set of solutions to a pressing social challenge. This sounds obvious, but we’re suggesting that organizational theories of change, business plans, and other foundational materials need to reflect systems thinking. The most important tool in the new systems entrepreneur’s suite is the ability to embed the solution into the larger system being targeted." "This progress was possible because [Evan] Marwell thought about the system he was trying to change as a whole, not about a narrower entrepreneurial opportunity or technical challenge. If more social entrepreneurs hope to effect change, they will need to think the same way." Please read the whole piece by clicking HERE.